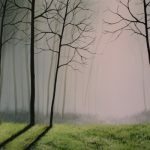 View cart “Misty Forest – 5 Lesson Set – Acrylic Lessons on DVD” has been added to your cart. Colors: Turner’s Yellow (or Yellow Ochre mixed with Cadmium Yellow Light), Raw Umber, Raw Sienna, Violet (or any form of light purple), Cadmium Yellow Medium, Cadmium Red Light, White, Black. Learn to paint Golden Break Stream in this 1.45 hour lesson. 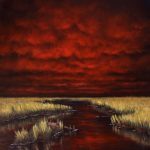 In this lesson, I’ll show you how to mix colors and use some easy-to-learn techniques to create unique clouds, grass, and water. If you prefer the Online version of this lesson, click here.